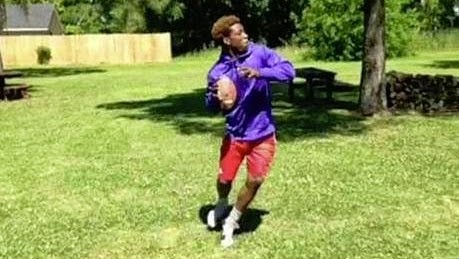 In a football move that could come straight out of The Flash comic books, Manvel (Texas) High School junior wide receiver Gary Haynes shows off just how quick he can be on the field by throwing a Hail Mary pass to himself. In April, Haynes told Rivals.com, "I'm really working on my speed right now. Like my straight-line speed. That's why I'm running track." Needless to say, the hard work is paying off. This past fall, Haynes had a team high 52 catches for 876 yards and 13 touchdowns for Manvel, helping lead his team to a 12-2 record along with qualifying for the 5A, Division II Texas state quarterfinals. The speedy receiver also rushed for two touchdowns, returned kicks and played cornerback. Haynes is a class of 2015 recruit and reportedly only has one scholarship offer coming from the University of Houston, but after such an impressive display of athleticism, more schools will likely be taking a closer look at the speedy receiver in his senior year.